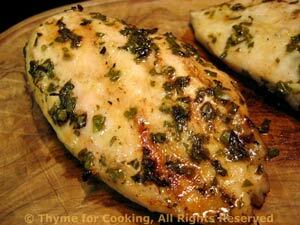 Thyme for Cooking easy summer recipes: Grilled Lemon Chicken Breasts. We're into lemon this week.... and fresh herbs. This should finish the cabbage. You could use skin-on chicken breasts or thighs and stuff the marinade under the skin. Cooking time would be longer if they were also bone-in. You could use skin-on chicken breasts or thighs and stuff the marinade under the skin. Cooking time would be longer if they were also bone-in. In small bowl whisk together oil and lemon juice. Mince garlic, snip herbs and whisk into lemon and oil. Put chicken in shallow glass baking dish and spoon marinade over. Let marinate 15 - 30 minutes. Cook on barbecue grill over indirect heat 15 - 20 minutes or on baking sheet in oven (400F) for 25 - 30 minutes or until done. 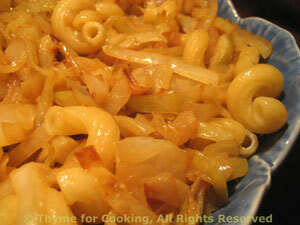 Baste with herbs and lemon after turning, then cover for 5 minutes. When done (knife poked in and juices run clear) remove from heat and serve.